The 10.5cm K18 Pz.Sfl.IVa "Dicker Max" is a rank III German tank destroyer with a battle rating of 4.7 (AB) and 4.3 (RB/SB). It was introduced in Update 1.57 "Battle March". The Dicker Max is a open-topped SPG with a 105 mm (10.5 cm), based on the Pz.IV E chassis. The 10.5 cm artillery gun is not only more effective than the StuH's 10.5 cm howitzer, but it is very consistent in terms of the results: hits that usually devastate the enemy. Its 14 second reload is not bad either, for a gun of its size, 4 seconds faster than the StuH, and over twice as fast as the KV-2's. The 105 mm HE round can also be effective on many lightly armoured vehicles like the M18 Hellcat. The roof of the superstructure does not fully cover the top, thus still exposing the crew members. Ammo racks of the "Dicker Max". As with any open-topped SPGs (such as the Marder IIIs), this is not a vehicle to charge the opponent with. However, one that can very effective at long ranges and from behind cover. An alternative play style for these vehicle in a closer range is supporting standard tanks by watching their flanks. 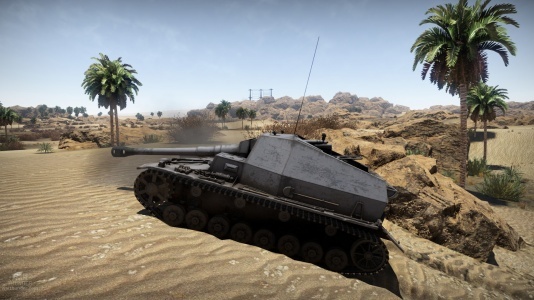 It is NOT a fast vehicle, especially in realistic and simulator battles, but once it finds a place to stop and take aim, its gun is a very, very efficient anti-tank weapon, comparable to that of the mighty KV-2 turreted assault gun. Its most notable feature is its extreme gun depression, over -15° to +10°, which allows this tank to take advantage of great hull-down positions behind hills, becoming near-invisible in RB and SB at distance. Its weakness however, is rather obvious: the crew compartment is thinly armoured, which means basically anything can penetrate it can cause havoc for the tank commander and his crew. Combined with its slow acceleration, this is a vehicle to be used in a tactical manner in both offensive or usually, defensive combat. 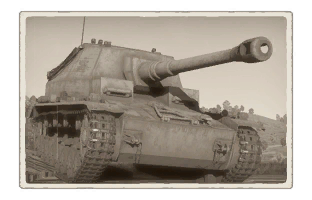 With only 50 mm of armour at a battle rating of 4.3, the Dicker Max can be defeated frontally by any vehicle of its rank, even at some range. It is particularly vulnerable to SPAAs with a high rate of fire (heavy machine guns can penetrate the rear, or shoot down into the cabin should the opportunity present itself) and large-caliber shells. Airplanes are also devastating, especially if they are full of guns. Artillery is also worth noting. 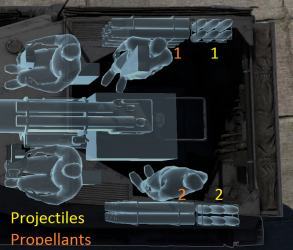 105 mm shells have excellent armour penetration. Gun is very accurate, even when stock. Somewhat fast reload for it's caliber. Nigh invincible from the front when hulled down behind a hill. The Pzgr.rot shell is a huge boost to it's already lethal gun, with penetration comparable to the 122mm guns of the IS-2. Very good in maps with lots of open grounds. Has no trouble when getting uptiered with the Pzgr.rot equipped. With the Pzgr.rot shells equipped, it can reliably penetrate the Panther's upper glacier, a feat that few guns in its rank could do. Introduced a new play style in the German TD tech tree that can be employed with great effectiveness with later vehicles on the tree. Stock shells are inadequate when getting uptiered. With a top speed of 20 mph and a slow acceleration, this SPG will not get to places very quickly. Bad in maps with urban environment. Vehicle turns at a slow rate, which is bad in any situation. Very slow at scaling cliffs and obstacles. Underwhelming performance of HE shells. Rear section of the fighting compartment sides are littered with ammo, shots there are often lethal. No coaxial or mounted MGs. The role of the “assault gun” in the German army in World War II gave the infantry an upper hand in assaulting fortification. However, heavy bunkers could withstand large punishment from artillery and closing up to the bunker for a closer shot exposed the assault guns and artilleries to defensive artillery weapon. A weapon was needed to fight bunkers at an extreme range that the bunkers and other defensive weaponry would not be able to return fire, something with a very heavy gun to destroy these bunkers. Krupp began development of such a vehicle in 1939, but such a vehicle soon became unnecessary with the conclusion of the Battle of France. Thus, the project shifted from a heavy “assault gun” to a tank destroyer. Two of these vehicles were built in January 1941 and were presented to Hitler in March 1941. It was hoping that if proved favorable, the vehicle would be able to be put into service and production by Spring 1942. The vehicle design during its development was called the 10 cm K. (Pz. Sfl. IVa) and the 10.5 cm K (gp.Sfl.). Another name it was called was Dicker Max (Thick or Fat Max). The design took a Panzer IV Ausf. E chassis and removed the turret to add an open-topped superstructure on top to hold the heavy 10.5 cm gun. The design had armour around 50 mm in the front angled at 15 degrees. Armoured compartments were present in the vehicle rear to protect loaders from overhead attacks. The front has a false driver port present on the right side of the vehicle with the real one on the left, whether it was there to deceive enemy fire or simply a design oversight is unknown. The commander, gunner, and loaders all have their own sights available to them to observe the landscape for targets. The engine is the 180 hp Inline-6 Maybach HL66P. Though the prototype vehicles used the Panzer IV as the basis, it is predicted that in production, the vehicle would use the Panzer III instead due to increased mobility of the suspension and running gear. Trials with the two prototypes Krupp produced were done by Anti-tank Battalion 521. The battalion took the vehicles with them during Operation Barbarossa. One was destroyed due to catching fire and an ammunition explosion, but the other was able to last until the end of 1941.The sole vehicle also saw use in the German offensive Case Blue in Summer 1942, but it was not reported to be operational by the battalion afterwards. Opinion of the vehicle was that it was unsuitable for participation in a frontal assault due to its low armour and maneuverability. The gun was deemed effective in supporting an infantry assault and knocking out tanks, but the heavy muzzle blast caused large dust to obscure the gunner view, requiring an observer to watch where the shots land. No reports were made on engine and transmission problems, but there were issues with the brake system. Due to these issues, the Dicker Max did not see mass production for widespread usage. Thus, only the two prototypes were made before interest in the project dropped. Skins and camouflages for the Dicker Max from live.warthunder.com. 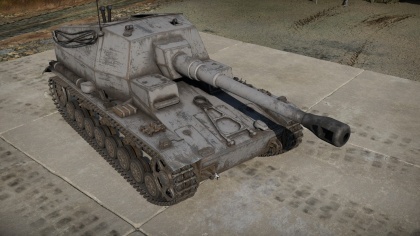 The "Dicker Max" showing off its amazing gun depression.